I’ve been waiting since the first rumours for Sonic Generations. Classic and modern Sonic? In the same game? Could it be true, would they muck it up, would they make the fatter, older Sonic use newer Sonic abilities to get through levels? General opinions on the Sonic games seem to suggest that the 2D games were always better, at least from those in my 20+ generation. In fact, I’ve rarely heard about the 3D games given any praise at all. It’s not really hard to see why. When I preordered Generations on Steam (for £19.99 by the way, great price), I received a download of Sonic 3D for free. It’s horrible in every way I can imagine. I had Sonic The Hedgehog built into my old Master System 2. For me, it was about getting to the end of the level fast with the most amount of lives possible, because I would always screw the game at the end and the poor MS2 had no save feature. I had pretty much the same experience with Sonic 2. Then I let things drift. I wandered to Playstation for a couple of years before my loving parents handed me a GameCube. Favourite game? SSX3. Not really relevant here but it’s true. Second favourite? Sonic Heroes. I loved it. It was bright and colourful, the characters were a laugh and I enjoyed playing as teams. For the Gameboy Advance, I had Sonic Advance. With the side-scrolling harking back to my old Sonic 1 and 2 days, I enjoyed it but again never finished. Then for DS (now my 3DS) I picked up the Sonic Collection for cheap. Sonic games 1 – 3 on one cartridge and it held me in excitement for this latest release. And now on to Sonic Generations. I’ve played for around 3 hours so far on the Steam PC version and loved every second. The music is spot on, nostalgic and so much alike the classic soundtracks. 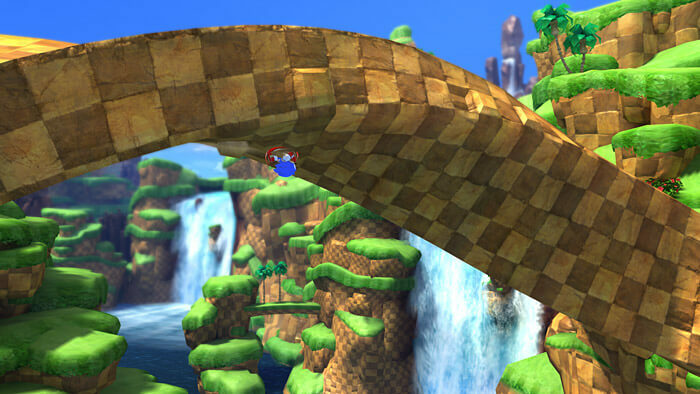 The levels are beautiful and faithful to the original games whilst feeling fresh and exciting, allowing the game to cater to both old and new fans. Stick an 8 year old in front of Sonic 1 and what would they think? Graphics and audio were from an older age. This is Sonic back and refreshed. Most of you reading this will have already seen gameplay trailers. If not, I recommend you have a look at the video below. Like Sonic games before it, Generations is split into different Zones and then Acts. The ever-favourite Green Hill Zone is first, followed by at least one zone from every Sonic title I’ve ever heard of. The first Act of each zone is played by classic Sonic, and the second zone with modern Sonic. Each zone has 5 challenge levels for each Sonic, and when you complete 1 challenge from 3 zones, you can play the Boss for that section. From what I’ve seen so far, this is a big game. The most important thing about this game for me is the speed. The character is called Sonic the Hedgehog. If Sonic’s slow, he’s just disappointing (Unintentional innuendo aside). In Generations, Sonic is fast, and I mean you-can’t-see-the-environment-clearly fast at times. Modern Sonic’s dashing along paths is blisteringly fast and it brings and smile, laugh and watering eyes whenever I realise I’m just running through baddies like they’re wet tissue. Playing as modern Sonic is a type of fun I’ve not experienced since Mirror’s Edge. Classic Sonic is cool, he’s nostalgia in a blue spikey-haired and slightly pudgy hedgehog. Modern Sonic is like greased lightning. The both play differently, their levels feel different. And that’s good, because Generations brings together my favourite aspects of all the Sonic games I’ve played. There is room for improvement. I did a gameplay recording and played it back and I noticed that I missed quite a lot in play. With the background as colourful and bright as the foreground, enemies and collectables can be quite difficult to see. Add to that Sonic’s speed, it’s really easy to miss a lot of what is going on. Also, on modern Sonic’s pathway dashing sections, the controls are noticeably stubborn and awkward for moving Sonic around. Each Act has multiple levels (as in bottom, middle and top) to run around on, some faster than others. There is plenty of space to explore if you can get Sonic there. Acts have collectables. You can use points to buy skills. Rings are there, Sonic’s friends are there. So far I love this game. I’ll let you know if that changes.